Born in a small Sichuanese city, Baishui is a composer and self-taught musician who plays guitar, piano and many traditional Chinese instruments. His earliest original compositions and performances were influenced by European neo-folk and dark ambient strains, but has expanded widely his musical canvas since. With neo-folk project Bloody Woods, experiment-in-randomness One Day In A Quark and under his own name, Baishui has been crafting intelligent and creative music across many genres, with musical inputs ranging from traditional Sichuanese folk ballads to 70s prog rock, atmospheric post-rock and beyond. Though his music was first rooted in Western rock and folk, Baishui was soon drawn to his own cultural traditions, which he employed in the creation of a distinctly Chinese neo-folk music. His 2007 release, Time, which was nominated for several mainstream music awards, is a mild, elegant and melancholic work imbued with a nostalgic look back at his hometown and a combination of traditional southwestern Chinese musical elements and his own unique singing style. 2008‘s Winter, meanwhile, was mainly instrumental but still creates a dark and altered form of folk that remained distinctly rooted in Chinese traditional music. 2009’s Rain Comes saw Baishui employ Sichuanese dialect in an effort to further delve into his roots, and the result is a folk album bursting at the seams under the weight of the millennia of traditions contained within. 2011 saw the release of two very different albums, demonstrating the range of his musical interests and inputs, and showcasing the breadth of his talent. Host of a Building Named Flower Terrace Temple set to music a collection of poems written by Baishui and his father, creating a timeless stripped-down acoustic music with a serenity rooted in Baishui’s own relationship with Zen Buddhism. ...Terrace Temple may well be the yin to the yang of his second 2011 release, A Travel Book, whose instrumental atmospheric soundscapes overflow with avant-garde, experimental, world music and post-rock textures, complex arrangements and a range of instruments. While the two albums may seem to be the product of very different artists, they reflect Baishui’s multi-faceted approach to the musical expression of his journey through life. His most recent work, City Of Lost (2012) and Some Other Place (2012), continue on the trail carved by A Travel Book, featuring sweeping cinematic soundscapes and a sound that certainly wouldn’t fit the ‘folk’ profile, but is obviously informed by it – along with a wide palette of musical influences, from prog-rock to noise, world music to psychedelic rock. 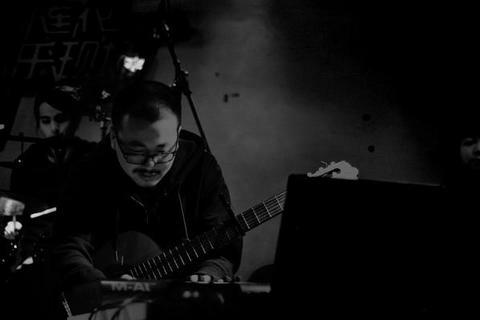 While ‘post-rock’ is certainly one signpost on the road to an understanding of Baishui’s music, it is not the straight-up post-rock so widespread in China today. In a manner that is extremely rare, the thread throughout all of Baishui’s work is the music’s near-religious serenity and atmosphere that transports the listener to a faraway place; foreign yet familiar, it is a place where Baishui is one of the only residents.